CNG: Printed Auction CNG 75. Caracalla. AD 198-217. Æ Sestertius (27.36 g, 6h). British victory issue. Rome mint. Struck AD 211. Sale: CNG 75, Lot: 1095. Estimate $500. Caracalla. AD 198-217. Æ Sestertius (27.36 g, 6h). British victory issue. Rome mint. 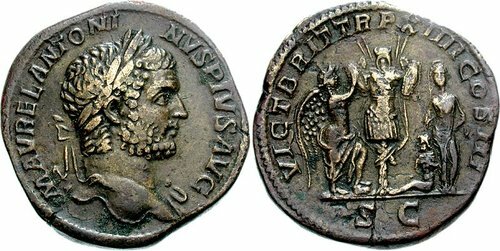 Struck AD 211. Laureate bust right, slight drapery on far shoulder / VICT BRIT P M TR P XIIII COS III P P, S C in exergue, Victory erecting trophy, foot set on helmet; on right, Britannia with hands behind back; at her feet, a captive seated left. Cf. RIC IV 464/483 (for obv./rev. type); Banti 133. VF, brown surfaces, hairline flan crack.